Early on in ones awakening process, one of the terms that gets bantered around a lot is “The Illuminati” , of course we think we know what it means. It’s “Them” , the Evil doers, the Elite bloodlines, the Masons, the “Super Rich ” the Rothschilds, the Rockefellers. No wait it’s the secrete societies, Skull and bones , Council of Foreign Relations , the Bilderberg Group, the Military Industrial Complex, The Alphabet agencies, the Black Operatives who work for the Roman Catholic Church. Hey maybe some are good guys, like the founding fathers who were actually very illuminated and made incredible contributions to mankind, becasue of their connection to extra terrestrial influences. Man those Bavarian dudes knew how to party. All I have to say is even after a couple years of thinking about it , I can’t really tell, definitively, whether the Illuminati are inherently good, or bad. Or perhaps now that we are moving beyond polarity , beyond duality, good and bad are just concepts that don’t work anymore, for many of us anyway, Black and White just don’t seem to make sense , its all grey. The growing awareness of secrete societies such as the Illuminati are at the forefront of the awakening or unveiling process that is now occurring. I remember back in 2008 when I was suddenly awakened by “ the dream ” , an experience I will never forget , I started to see the reality behind the reality in everything around me. The symbolism is everywhere on this planet, just pull a dollar bill out of your pocket and look on the back at the pyramid, a classic Illuminati Symbol. Much of the discussion about the Illuminati of course is based around this global cabal that are bent on taking over the world , also know as the “New World Order “. Hate to break it to you people , the world was taken over so to speak, long before any of us were around this goes back thousands of years, this is just the latest incarnation. In the beginning of my awakening process I was rather in shock at this whole secrete society, divine right to rule bloodlines concept that goes all the way back to Babylonia and beyond . My god how could I have been so asleep and missed all the clues. Well it turns out we are born into this “System” This “Program” , and it’s no surprise that many are still asleep, with all the distraction in life like basic survival and dancing with the stars, let us never forget dancing with the stars, this has sort of been coined as the symbol of sheepleness. The basic premise behind this control grid of ruling elite , bloodline, societies like the Illuminati is that they have over the centuries morphed into something that appears to be fairly benevolent, like the Masons and the Skull and Bones and those that visit Bohemian Grove. The method of operation for these societies has gone from being obviously overt like the days of Hitler , Mussolini and the like to completely covert, like our American society. In today’s world you have a seemingly free humankind, where individuals don’t even realize they are slaves to a small group of ruling bloodlines on this planet. It’s rather like the frog in the pot of water that is slowly being brought to boiling. As the water starts to heat up , one thinks how nice it feels , like a warm bath, as the water increases in temperature however the frog start to get a little uncomfortable, and that is the stage we are well into for most of us. As we move through 2011 the water is getting very uncomfortable and the pot is getting increasingly smaller, and many are beginning to panic as the social economic control grid is getting more heavy handed and options are running out for the common frog, I mean man. Upon first glance and recognition of the existence of the Illuminati, the most common reaction is to judge all of it as negative, on the other hand the Illuminati or “The Illuminated Ones” were also involved in things that could be called positive or to help man kind. As with all things in this polarized reality, the situation is always grey , never Black and White . As I have become more seasoned in my awakening process I try not to jump to conclusions , in fact conclusions turn into belief systems and beleif systems are perhaps another trap , another form of limitation. 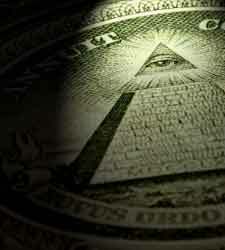 So yes there are likely bad Illuminati and Good Illuminati if you will , as is the norm here in duality land. In a universe where “All Things” are allowed expression its best just to observe and stay open to all possibilities, and not allow yourself to be drawn into the battle of duality. This battle rages on in perpetuity for those that are blind to it , you can see it everywhere in today’s society its also know as divide and conquer. This is the advantage of being awake, this is the purpose of Apocalypse How ,to help educate others about the Nature of the Reality we find ourselves in. The greater your perspective, the deeper your perception the better you can Navigate this incredible moment in our personal exploration of the cosmos. Here is an excellent interview with David Icke and Mike Hanson , David breaks down the over all structure of the so called Illuminati hierarchy giving a great over all modern persepctive of what this control system looks like. Here is a video partially narrated by Jordan Maxwell on the Illuminati / New world Order. It’s a quick overview,this should get you started , the videos and data are piling up , hey it’s a reality get over it, learn about , never fear it. Lets awaken and lets turn the light on the enlightened ones.